O Jesus, my Eucharistic Friend, accept this Novena of Holy Communions which I am making in order to draw closer to Thy Sacred Heart in sincerest love. 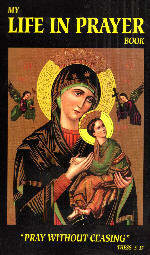 If it be Thy holy will, grant the special favor for which I am making this novena. O Jesus, Thou hast said, "Ask, and you shall receive: seek, and you shall find: knock, and it shall be opened to you." (Matt. 7:7). Through the intercession of Thy most holy Mother, Our Lady of the Blessed Sacrament, I ask, I seek, I knock; deign to grant my prayer. O Jesus, Thou hast said, "If you ask me anything in my name, that I will do." (John 14:14). Through the intercession of Thy most holy Mother, Our Lady of the Blessed Sacrament, I most humbly ask Thee in Thy Name to grant my prayer. O Jesus, Thou hast said, "If you abide in me, and if my words abide in you, yon shall ask whatever you will, and it shall be done unto you." (John 15:7). Through the intercession of Thy most holy Mother, Our Lady of the Blessed Sacrament, may my request be granted, for I wish to abide in Thee through frequent Holy Communion. O Lord, I believe that I can do nothing better in order to obtain the favor I desire than to attend Holy Mass and to unite myself in Holy Communion most intimately with Thee, the Source of all graces. When Thou art really and truly present in my soul as God and Man, my confidence is greatest: for Thou dost Want to help me, because Thou art all-good; Thou dost know how to help me, because Thou art all-knowing; and Thou art able to help me, because Thou art all-powerful. Most Sacred Heart of Jesus, I believe in Thy love for me! O Jesus, as a proof of my sincerest gratitude, I promise to receive Thee in Holy Communion as often as I am able to�at every Holy Mass I attend, if possible. Deign to help me to love Thee in the Holy Eucharist as my greatest Treasure upon earth. May the effects of frequent Holy Communion help me to serve Thee faithfully, so that I may save my soul and be with Thee forever in Heaven. Amen.